This is the ninth in a series of articles on the Ten “Must-Have’s” in your Landscape. 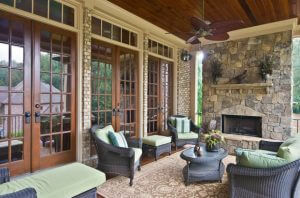 Outside entertaining has become more popular in recent years. 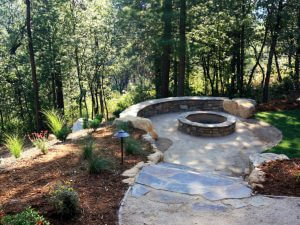 We have seen the addition of outdoor fire places, fire pits, patios, outdoor kitchens, and even outdoor living rooms. We have taken the entertaining outside which is great, but it can be somewhat challenging with our Georgia summers! Just make sure you have a shade option somewhere close by. No longer is the burger flipper alone outside cooking. They are now surrounded by the party goers because there usually is a place for them to congregate (other than in the kitchen). 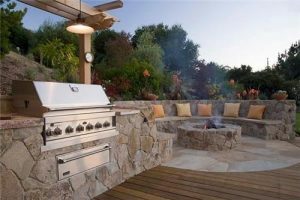 So when you are thinking of grilling areas, think also of making the area inviting for guests when you are entertaining. Locate the grill near a patio with table and chairs nearby, and perhaps a shade umbrella. Dress this area up using container plants and conversation starting yard art. 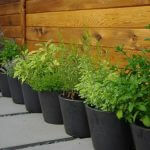 This is a great space to include a few herbs in containers by themselves, or mix them in with some colorful annuals. Also include some mosquito plants (citronella geraniums) which do well in containers provided they get sunlight. The guests will be thankful for those little plants to help ward off the mosquitos. If you grow some of your own vegetables, the vegetable garden can become a landscaping feature for your yard. If it is going to be a feature, then some thought needs to go into the aesthetics of the garden. 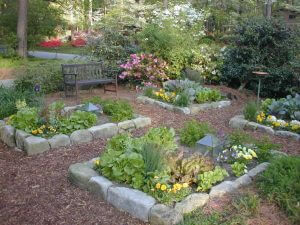 Some vegetable plots look interesting all year round with raised beds and some garden whimsy. The garden to the right would still look attractive even if it wasn’t planted out. However, vegetable gardens can get quite messy at different times of the year and this is not really something you want your guests to view from your entertaining area. Ideas for messy gardens? Add a fun rain gauge, whimsical thermometer, or inspirational stepping stones. 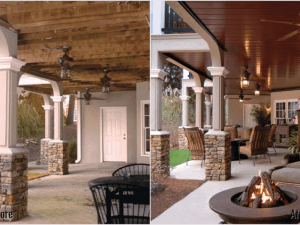 An option for creating a shaded dry area outside for guests is to add a ceiling to an under deck patio. Notice the difference in the entertaining space created in the picture to the right before and after the ceiling has been installed. This is a reasonably easy option and one that we did in our yard. We now have a great space to sit and watch the rain and to give us some respite from the summer heat. By adding a few container gardens, outdoor wall art, and pillows, your space will be inviting and comfy! My husband cranked up the fire place in June! I thought he was crazy, but he was entertaining and the outdoor fire place gave him and his friends a focal point to sit around. 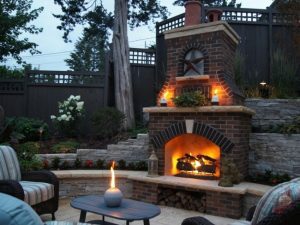 Fire places are an extremely attractive addition to a landscape. (We carry portable fire pits at The Family Tree if a fire pit is not an option.) They usually include a seating wall and some sort of patio. Seating walls are great as they act as a barrier between the entertaining area and the rest of the landscape and also provide additional seating. Cushions & pillows needs to be available as the seating wall can be cold and hard to sit on. There is often a lot of hardscape material in these entertaining areas so it is important to soften it a little with plant material. Colorful, large containers filled with annual color will do the trick. Think about planting a container of plants that attracts hummingbirds or butterflies. Fire pits are very social gathering places. More people can fit around a fire pit, than hovering in front of a fire place. Portable fire pits can be purchased making an instant gathering place. Allow plenty of room around the fire pit so that you can have a lot of chairs and make sure you always have the ingredients for S’mores available. Screened in porches are invaluable when the bugs start to appear. Again, soften this area with container plants as you are trying to achieve a transition between the inside and the outdoors, so natural elements should be part of the design. Be prepared to deal with pollen accumulating on your furniture in early spring! If you are still not sure where to begin, come in and see us at the Family Tree. 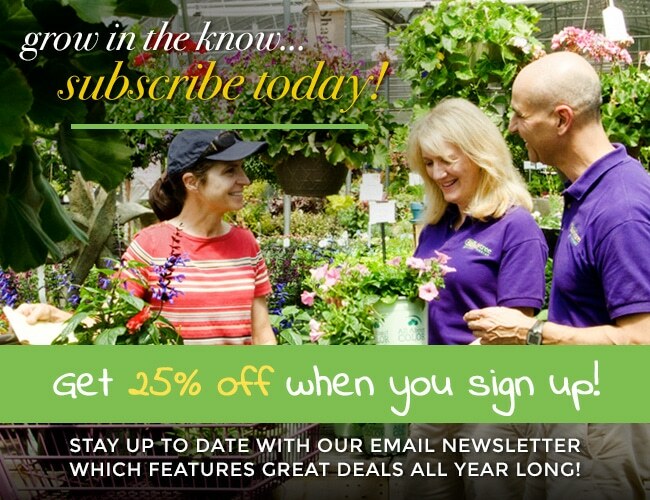 We also offer a free Quick Sketch or a full Landscape Design Service that will help you get started. Be sure to check out the rest of Tracy’s list of the top 10 ‘must-haves’ for your landscape!